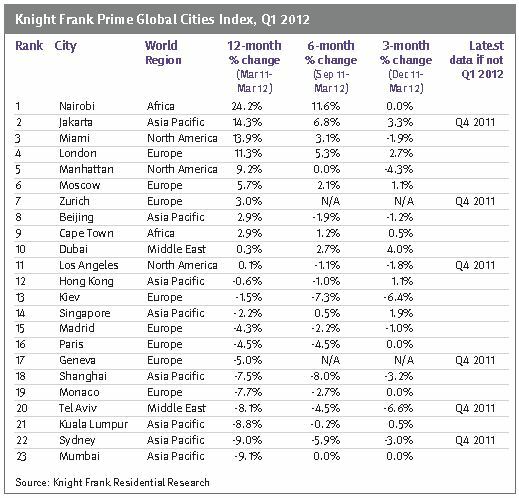 The value of prime property in the world’s key cities fell by 0.4% in the first quarter of 2012. This represents the index’s first quarterly fall since the depths of the global recession. Despite the overall index’s sluggish performance four prime markets achieved double-digit growth over a 12-month period; Nairobi, Jakarta, Miami and London. Perhaps most surprisingly is the fact that the top five performing cities were spread across four continents – North America to be the only continent to appear twice (see below). The safe-haven argument still resonates. Capital flight will continue to focus on cities with low political risk, transparent legal systems, good security and ideally those with an HNWI-friendly tax regime.